The fi-7300NX is an Image Scanner that supports web systems and connects directly to client systems. Users can begin scanning from the scanner’s touch screen or from various applications on smart devices to suit all business needs. Not only is direct data transfer to client-unique web systems possible with SDK use, but secure data transfer is also possible with strong data encryption. The fi-7300NX boasts a speed of 60 ppm/120 ipm (200/300 dpi) for scanning A4 portraits, loads up to 80 sheets at a time, and ensures utmost efficiency as the first standalone* scanner in the world to support 5 GHz Wi-Fi. The 4.3” touch screen enables users to perform operations intuitively, like scanning and data checking, with thumbnail reviews of scans and the screen also displays messages or instructions with illustrations so that users can handle errors themselves. Users can scan and save documents without any requirement for a local computer, they can simply login to the scanner using user authentication and select a job from their personalized job menus on the fi-7300NX’s touch screen. Customized job menus ensure efficient and secure decentralized data entry is possible for each user. The fi-7300NX supports NFC (Type-A and Type-B) authentication and user authentication with username and password input on the touch screen. It is also possible for different job menus to be assigned to each scanner, and avoid any authentication processes. With PaperStream NX Manager, users can scan from mobile or web applications opened up on smart devices or thin client terminals. Seamless integration into company systems enables use of a variety of devices for scanning operations. The user authentication function, job menu, and other scan settings are all centrally managed with PaperStream NX Manager and Scanner Central Admin. With the fi-7300NX’s server software, there is no need for the conventional single client computer to scanner environment and the system administrator to stand by the scanner. This reduces the total burden of installation, expansion, operation, and management. Manage jobs and process images with PaperStream NX Manager. Monitor scanner operation with Scanner Central Admin. 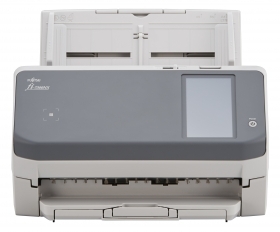 When scanning with computers, the fi-7300NX can be used with PaperStream IP, a specialized scanner driver for Fujitsu image scanners, via Wi-Fi connection, wired network, and USB connection. Connection without need for the USB cable allows the scanner to be positioned wherever needed, to improve user productivity, reduce interruptions, and make more room for more frequently used equipment.